In 1998 Arapahoe Acres near Denver became the first modern neighborhood added to the National Register of Historic Places. Two Eichler developments, Greenmeadow and Green Gables of Palo Alto, followed in 2005. Above: Arapahoe Acres home today. Top: Greenmeadow street, mid-1950s. 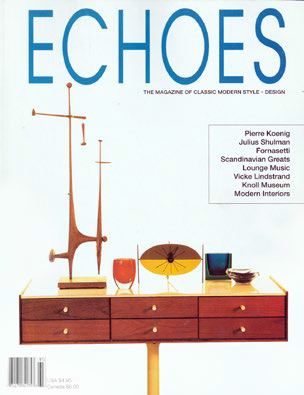 Echoes magazine debuted in 1992, and carried on for a decade, as the first publication of the MCM revival. The Eichler Network's Marty Arbunich and South Bay realtor Jerry Ditto broke out with their own Eichler newsletters in 1993. Pictured here: Arbunich's Eichler Network. "Mid-century modern became more popular and more mainstream than Art Deco. It got more general recognition in the mainstream media," she says. "Deco was more of a specialty niche." "[Mid-century modern] resonates with people. It has that timeless appeal," she says. The magazine ceased publication in 2002 when Cheverie-Pugh and her then husband, the magazine's publisher Scott Cheverie, divorced. Today copies of Echoes themselves are collectables. "That's the best compliment you could get," she says. "People enjoy it." In 1993, the increasing emphasis on mid-century modern homes got a shot in the arm when not one but two newsletters got underway to serve Eichler homeowners. 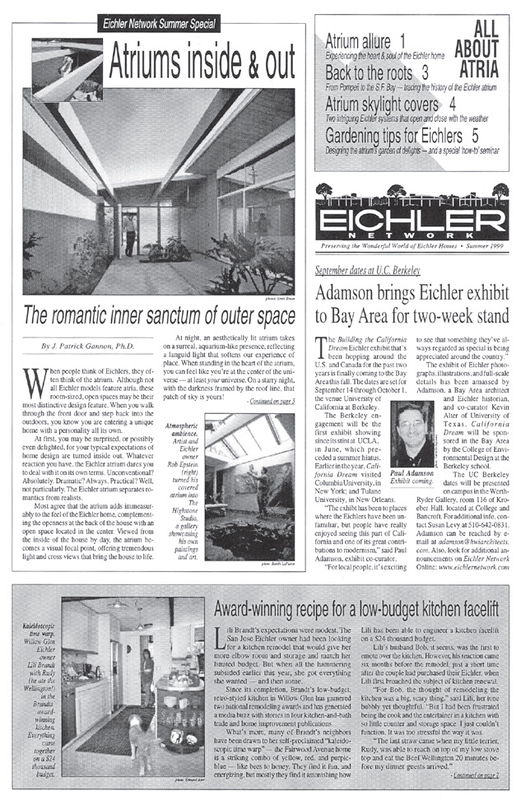 Jerry Ditto, a real estate broker, created Eichler Insights, with an emphasis on Eichler real estate and some history; and the Eichler Network began another newsletter, simply called the Eichler Network, exploring Eichler history and home improvement in depth. The latter continues today as CA-Modern magazine and the Eichler Network website. "1993 was the Dark Ages," says Marty Arbunich, publisher of CA-Modern and director of the Eichler Network. "There was no information out there about Eichlers. There were no resources at all, and very few service companies that understood the homes. Homeowners were starving for somebody to give them some attention. I would say that 40 percent of people living in Eichlers back then didn't like them. Then a transformation began to occur." Other magazines that focused largely on mid-century modern, some broader in scope, followed, including Wallpaper in 1996, Modernism in 1998, and Dwell in 2000. Two books about Eichlers, beginning with Jerry Ditto's Eichler Homes: Design for Living in 1995, played a major role in increasing appreciation for homes too many people were taking for granted, if not actively harming through wrong-headed remodeling. Seven years later Eichler: Modernism Rebuilds the American Dream, by Paul Adamson and Marty Arbunich, emerged as a kind of bible for Eichler fans. Retailers and manufacturers got on board too in the late 1990s. The furniture company Herman Miller, which had produced so many iconic pieces by Nelson, Eero Saarinen, and others through the mid-century, began making them again in the mid-1990s. "That would not have happened without my book," Greenberg says, recalling that she spent three days in the Herman Miller archive while researching Mid-Century Modern. "My book was essentially a catalog of their furniture designs of the postwar years," she says. In the late 1990s, the Design Within Reach chain and website first appeared to market such furniture. A Library of Congress exhibit of Charles and Ray Eames in 1999 brought attention nationwide to mid-century modern style. "Eames Chairs are bending the market," the New York Times headlined in 1998, quoting one gallery owner bragging, "20th Century design is stronger than ever."